And that whirl of distractedness gave me food for thought. We humans have a limited amount of attention, for certain values of “limited,” of “amount,” and of “attention.” Unfortunately, where we go wrong is trying to force our attention, putting a number on the amount of attention (or time, or resources) we have, or thinking we even know what attention is. I don’t know exactly what attention is, I do know I can’t force it (I have to trick myself into paying attention), but I can tell you that attention isn’t a number. “Attention” is a mass noun, not a count noun, and it’s as messy as slime. Attention is that kind of quantity. We “pay attention” (the metaphor is interesting), but the amount of attention we have is one, some, and many. Cal Newport, in Deep Work, suggests picking a small number of goals and setting aside “deep work” time to those goals. Implementing his idea is not easy. In order to focus on my goals, I have been trying to clear the decks. I have been unsubscribing from every email list I’m on, throwing out unfinished projects, and putting less-important tasks on to-do lists so I don’t have to think about them when I’m writing. In other words, I’m focusing my attention–but focusing mostly on getting rid of the things I don’t want to focus on. It produces a very tidy study, and the illusion of clarity. And you know what I have found? That I have one-some-many attention, and one-some-many time in the day when I can get things done. In other words, I need to lower my expectations, and aim for one, some, and many. Recognizing that there are many things going on at any one time, including cars passing outside, breaths I’m taking per minute, the clatter my husband is making, and the to-do list at my elbow. All of them worthy of my imperfect, fragmented, divided attention. There. 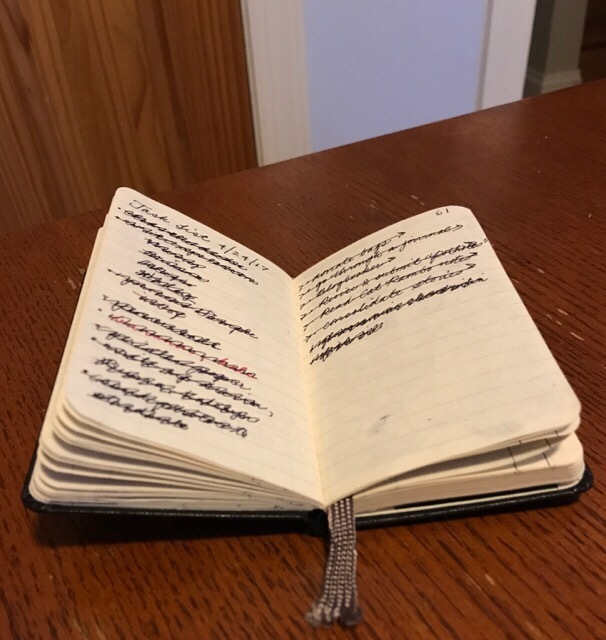 That’s one thing done (crossing off the task list entry that says, “write blog post.” Now to get some other things accomplished, and to appreciate the many other things that are competing for my attention. *From the article: “So does being “bad at math,” whatever that is, make you anxious, or does being anxious make you bad at math?” The answer is yes. I was always good at math, myself. It’s a game, with rules, and if you learn to play the game it’s kind of fun. †There’s a reason that “belongingness and love” are just above safety and physiological requirements in Maslow’s hierarchy of needs. Being loved is nice; loving others is essential to my well-being. I love my rescued gimpy cat with one fang. I love my students. I love my husband and my daughter. But I’m still an introvert. Go away and leave me alone. ‡I retired a year ago and looked forward to devoting a good chunk of my time to writing. Instead, the election happened, and I have devoted a good chunk of my time to activism. I don’t much mind. I’ve never been good at predicting what I was going to be doing next. §Two things I have learned: Donating money to things you care about is essential, and so is getting the hell off the guilt-provoking mailing list that immediately results. Two other things I have learned: Mail coupons and limited-time deals you get for being on frequent buyer programs are overrated. They don’t save you money if you have to spend money. I have enough stuff. Goodbye, Aveda, Plenti, DSW, and everybody else except Goulet Pens (I love looking at their emails). || I’m not allowed to buy any new books until I have read the ones I have. It’s going well, thank you. I’m only in a little pain. I go to bookstores and scan titles I like into my Goodreads list, and then don’t buy them. As a result of this project, I find I’m actually reading more than I was before. ** I taught a semester of student practicum at a large local university this spring, as an adjunct.†† My sophomores were very sweet, and the school where they were observing was great, but no matter how much I explain child development to my students they persist in believing that you can teach most four-year-olds to read and do math. The purpose of preschool is to socialize children so that they think school is a good idea, to enrich their environment, and to provide daycare. ††I made very little money as an adjunct, worked very hard, and turned in my grades last week. I have no idea what that immense tuition goes for besides buildings, endowments, and research. It certainly doesn’t go to faculty salaries. College is a bizarre racket right now, up there with professional sports and the way insurance has come to dominate our view of necessary expenses. Oh, and the stock market. Yes, I’m a crank. It’s fortunate I don’t drink, or I’d be backing you into a corner lecturing you about the way double-entry accounting has destroyed capitalism. Really enjoy many of your posts. I agree with many, learn some, and can cross one more thing off my to-do list. Thanks! Yep, yep, yep. This is me. Even down to the moleskine notebook!